It’s common knowledge that your Toyota needs routine maintenance like oil changes and brake repair, but who wants to spend more than necessary? Here at San Marcos Toyota, we offer a rotating selection of auto repair coupons so you don’t have to dread getting your car serviced. And whether your vehicle needs tire alignments, brake service, or major repairs, you can place your confidence in the experienced technicians at the San Marcos Toyota service department. After you’ve taken the time to browse our Toyota auto service specials online, schedule service today and make your way from New Braunfels to our dealership! It’s Warming Up! Is Your A/C Ready? Save BIG on Fluid Flush Services! Bring your vehicle in for service & present this coupon along with your Military I.D. to receive 15% OFF any service or repair. Any make or model. Must present coupon at the time of service. Plus tax & shop supplies. Military I.D. must be presented at time of service. Not valid with any other offer. 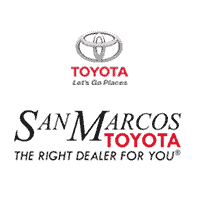 Valid only at San Marcos Toyota.